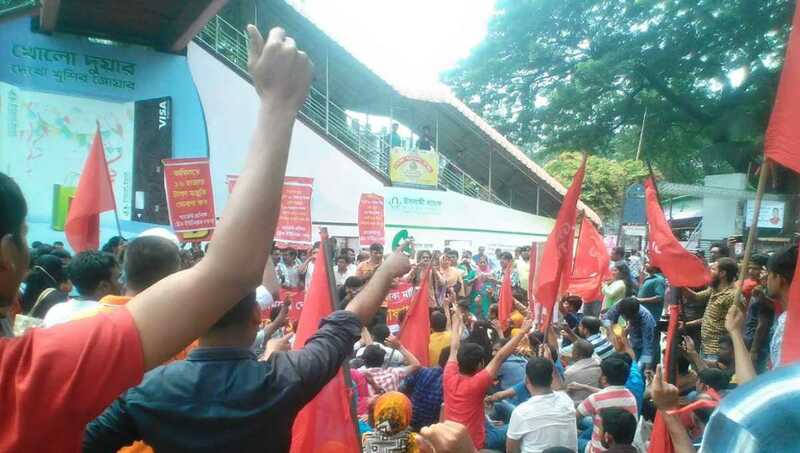 Rejecting the fixation of minimum wage at Tk 8000 by the government readymade garment (RMG) workers on Friday staged demonstrations in the city and demanded Tk 16000 as minimum wage. Several hundred garment workers under the banner of ‘Garments Workers’ Trade union Centre’ a platform of RMG workers, staged sit-in in front of the National Press Club around 11:30 am, said Abul Hasan, officer-in-charge of Shahbagh Police Station, according to UNB report. They also brought out a precession protesting the government decision. When speaking, Joli Talukder, general secretary of the union, said, “The fixation of minimum wage for RMG workers is unjust and illogical.” She also urged the government to reconsider the decision.